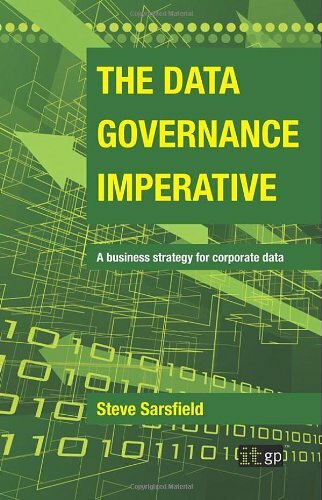 If you are active within the data quality and data governance community then chances are you will have come across Steve Sarsfield and his excellent Data Governance and Data Quality Insider blog. Steve has also published an excellent book, aptly titled “The Data Governance Imperative” so we recently caught up with him to find out more about some of the topics in the book and to pose some of the many questions organisations face when launching data governance initiatives. DATA QUALITY PRO: What does a typical “sales process” look like for promoting data governance internally? Are there any best-practices you can share based on your observations in industry? STEVE SARSFIELD: If you believe that data governance is not only about technology, but it’s also about people and processes, then selling the concept within your company must be approached with all of those three things in mind. Since data governance is a business strategy, selling it to the business involves understanding the company’s pain, understanding the procedures that are currently in place, good or bad, and making changes to alleviate the pain and make processes more efficient. These illustrate an IT manager making a pitch to business. We can reflect upon it to describe what we must do as data champions to sell data governance into an organization. In the commercials, focused on the Green IT initiative, we see IT staff talking to management in a language they can understand – money. If the IT manager had talked about kilowatts and power usage, the pitch would have fallen flat. If there’s anything that we can learn from this it’s that selling data governance needs to reflect economic gains and should never get into the fine details of database sizes, metadata management nor nulls and duplicates. Leave that type of discussion for the technical team meetings. The sales process instead has to focus on inefficiencies in the way the company is doing business. Is your company making important business decisions based on gut feel rather than valid information? Does your company need to comply with regulatory edicts like Basel II, SOX or HIPAA but can’t comply because of data? What inefficiencies exist in your supply chain, billing or customer service data that could save the company money? Finally, we shouldn’t be above leveraging a crisis to start in on a data governance initiative. As data champions, we should always be on the look-out for the marketing mailing that goes wrong, or missed deadline in manufacturing caused by inconsistencies in the supply chain. These are opportunities to drag our companies into the world of data governance. DATA QUALITY PRO: In light of the current economic climate, are you seeing organisations halting data governance initiatives or recognising the benefits and moving forward? STEVE SARSFIELD: I’ve seen polling numbers that indicate that there is not a significant slow-down in interest in data governance, although a few companies are delaying investment. The continued interest even in tough times makes perfect sense. If your company is growing, you’ll have growing data volumes. If not, your company will still be looking for ways to become more efficient. Data governance provides that efficiency. DATA QUALITY PRO: In chapter 5 of your book, you present approaches for data profiling, discovery and creating assessment processes that deliver KPI’s and reporting. These are obviously data quality related activitiesso how do you explain the relationship between data quality and data governance? STEVE SARSFIELD: For many organizations, data governance takes the shape of a series of coordinated data quality projects. If data quality is the tree then data governance is the forest. If we’re just fixing data in a CRM system, with little regard to other enterprise systems, that’s data quality, and there will be certain efficiency improvements in doing just that. However, if we’re coordinating our CRM project with the billing system and the supply chain systems, that’s data governance, and we’re certain to realize better efficiencies still. Communication to the entire company that it’s everyone’s job to improve information quality. One of the best strategies for maturing your company from simply doing data quality to a full data governance program is to track return on investment. Sadly, many project managers don’t take the time to calculate ROI on their data quality projects. To sell the concept of data governance, many project managers choose high-value data quality projects and follow the money. If you communicate ROI, you can use those wins to ramp up a more enterprise-wide approach. DATA QUALITY PRO: In “The Data Governance Imperative”, you advise organisations of the need for a data governance champion to help sell the concept to the business. What kind of traditional roles in the organisation do these people typically have? For example, are they generally business side or more IT focused in your experience? STEVE SARSFIELD: In the projects I’ve observed, the data champion more often than not come from the IT side of the house. Of course, having IT project management experience under your belt is a huge advantage, as is prior data integration experience. However, there are certain non-technical skills that go along with being a data governance champion. First, you need passion. Champions are passionate about data governance and promote its benefit to all whom they meet. Secondly, you must garner respect. A data champion is someone who is the glue between executives, business, IT and third-party providers. You really need to understand what drives all members of the team with all their backgrounds and have their respect. There’s also a certain maven-quality to a good data champion. A ‘maven’ is someone who wants to solve other people’s problems, generally by solving his own, according to Malcom Gladwell, author of The Tipping Point. A data champion needs to be socially connected and willing to reach out and to share what is known about data governance. If you’re the type of person who prefers closing the office door to avoid others, you may not be an effective data champion. A data champion must smile and train themselves to think positively and lead. Positive thinking is contagious and your optimism will build positive energy for your project. Being a data champion is as much about managing people and resources than it is about technical know-how. DATA QUALITY PRO: How long can it take a typical organisation to start witnessing the benefits of a data governance strategy? STEVE SARSFIELD: Your goal should be that you begin observing benefits of a data governance program immediately after completing your first coordinated data quality project. Quick wins help you leverage the benefits of one data quality initiative for getting funding for the next and the next. If you want to kick off a data governance initiative, pick high value, high ROI projects at first. Even if there is no money to spend on information quality, there still may be potential for information quality wins for you to exploit. For example, let’s say you were to profile or make some SQL queries to find some major inconsistencies in your supply chain. Working with the procurement team, you can determine the value of the find. Maybe you’re holding too much stock in inventory, for example. Then use some guerilla marketing techniques to extol the virtues of data governance. After all, if you could find this with just SQL queries, consider how much you could find with a data discovery/profiling tool. Better yet, consider how much you could find with a company-wide initiative. DATA QUALITY PRO: Are there any common mistakes you typically witness organisations making on their road to data governance maturity? How can they be avoided? STEVE SARSFIELD: Perhaps the biggest mistake I see is project teams not taking a baseline measurement of the current state of data quality and tracking return on investment. It’s amazing how many project teams are convinced that there is no ROI, therefore there is no need to track it. If there is really no ROI, you shouldn’t be in the project. If the data you’re improving is being used in business, I guarantee there will be ROI to be had. Track ROI even if your boss absolutely believes in the data governance initiative. Track it as if your life depended upon it. If there’s a change in management or a merger, you may have to justify your team’s value. Data champions should also remember the “do nothing option”, something I learned from the data governance team at a major telecommunications company with a very successful data governance implementation. Always calculate what will happen if you do nothing about the data quality – the “do nothing option”. Sounds simple, but it’s very powerful. In your scoping and ROI documents, make sure that you state both the ROI of improving information quality processes and the potential risks that you run when you ignore it. This may be just the boost you need to get your resources approved by management. Product marketing professional with proven track record of increasing sales, sales enablement, product promotion and market expertise. Data governance expert, speaker, author and blogger. Author of the book “The Data Governance Imperative”, published by IT Governance in 2009.